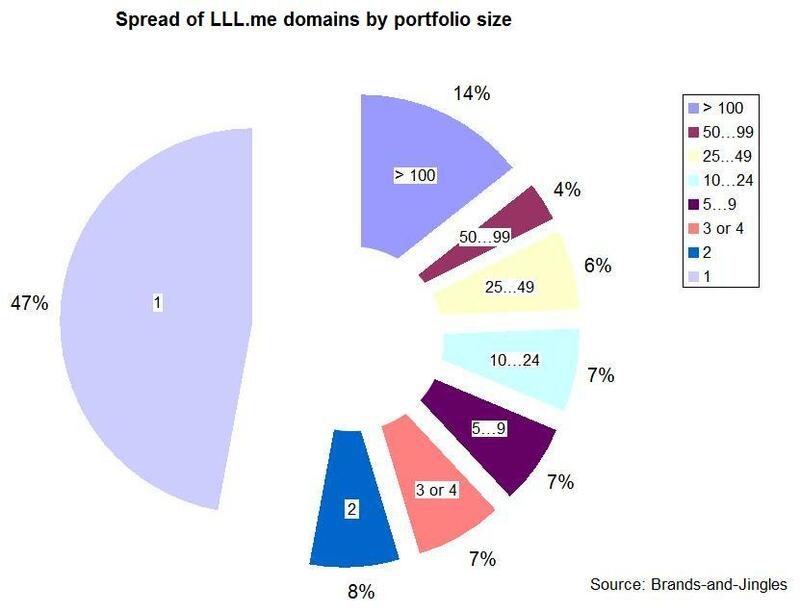 Considering popularity of short LLL.me names, we continue analysis started in the previous article. It looks like practical.ly 100% of NNN.me (three numbers) a gone. So if you are looking for some, get ready to pay pretty sweet sums. In the LLL.me area (three letters, letters only), 60% are already taken, leaving some good abbreviations still available for the public. If you are interested in the complete list of the available names, please contact us. As to the players, nine of them have more than 100 LLL.me in their portfolios. Uri Gershovitz with 196 names, some jingly ones, like: xml.me, 4wd.me, 4th.me, and 5th.me. Though, Mr Tatarczyk main.ly specialises in names, like elliot.me, recent.ly sold on Sedo. Tal has a good taste for domains like a2z.me, abc.me, diy.me, fra.me, lol.me, pls.me, zoo.me, which are potential hits, no doubt. The other 50% are spread approximate.ly 25%25 between people holding few names and many of them. Now, the hackers go for eight-letter domain names. These four are just the most recent examples: eyu35ryg.me, wry4q55.me, u45uartu4.me, adtu4q5u.me. A propos, olive.me went for USD 500. Have recently seen a person registering goo.me – interesting, was it a drop?